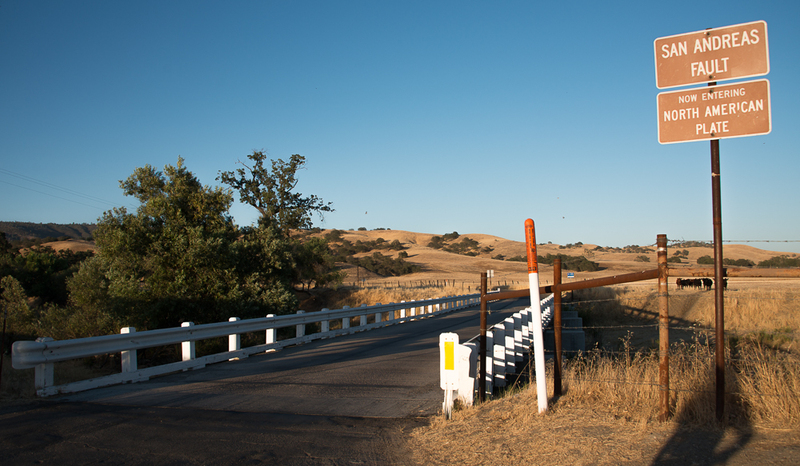 We've traveled to the east side of Monterey County after spending two months along the coast. This week's bridge is in the town of Parkfield, which is famous for experiencing a moderate earthquake on the average of every 21 years (1857, 1881, 1901, 1922, 1934, 1966, 2004). 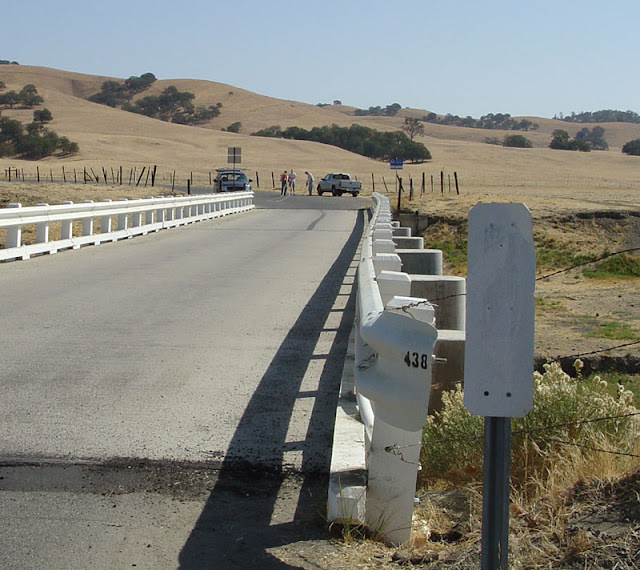 The Parkfield-Coalinga Road Bridge (44C0141) crosses over Little Cholame Creek, which is also the surface trace of the San Andreas Fault (the source of these recurring earthquakes). 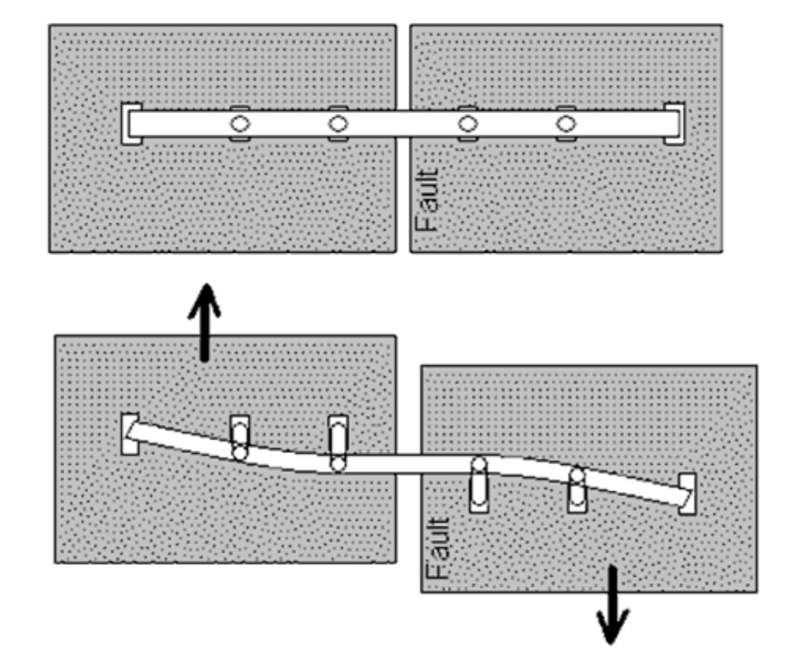 The fault is right lateral, which means when you face it, the plate across from you is moving to the right (see figure below). Therefore, a bridge crossing a right lateral fault would eventually have a flattened 'S' shape. The photo below was taken by the US Geological Survey on September 29, 2004, one day after the 2004 earthquake. They reported that the bridge has about 5 ft of offset (due to the 2004 earthquake, the 1966 earthquake, and due to aseismic creep). However, the photo shows the bridge rail with a reverse 'S' shape. However, the abutments may have allowed the ends of the bridge to slide instead of restraining them. In the photo below, we can see the girders are sitting on a seat-type abutment with shear keys a few feet to each side. Professor Goel reported that after the 2004 earthquake, "Angle iron apparently installed in an effort to restrain transverse motion of the superstructure at the bearings was knocked free." I took photos of the abutments and piers to try to understand what happens to a bridge over a fault. The first bridge at this site was built in 1936 (according to the University's Space Research Association) but it was replaced in 1960 with the current steel stringer bridge. However the 1960 bridge was recently retrofit with new concrete bent caps cast under the existing superstructure and with new CIDH piles cast on each side of the 'H' pile supports. The retrofitted structure obviously hadn't been around for the 1964 temblor, but the bridge may still have the displaced shape from the earlier earthquake. During an earthquake, the bents on each side of the fault move in parallel but opposite directions. The superstructure is restrained to follow this offset by the bearings, the angle irons, and eventually by the concrete shear keys and to take on the noticeable 'S' or 'Z' shaped configuration.